Innovation is a central focus in Mississippi’s current economic strategy. The number one industry in this state is agriculture, a sector that is comprised of over 260,000 jobs. This is almost 30% of Mississippi’s total labor force. Given the challenges to feed a growing worldwide population, innovation and state-of-the-art technology is pivotal in the 37,100 farms encompassing over 10.9 million acres of the Magnolia State. Scientists and engineers at start-ups, established businesses, and universities experiment with disease control, sophisticated irrigation systems, agrobots, drones, and software systems to analyze weather and soil patterns while collecting data from crop sensors. Another leading industry in Mississippi is manufacturing. As the top revenue-generating sector of the state’s economy, Mississippi Manufacturers account for 14.38% of total state output, employing 12.66% of the workforce. The state’s centralized geographic location also provides single-day roadway access to more than 55% of U.S. businesses. Manufacturers in Mississippi produce chemicals, machinery, motor vehicle parts, food and beverages, electrical equipment, and appliances that are sourced to other state businesses. When businesses of any size develop products such as these or experiment with innovative farming techniques as discussed above, they may be eligible for Federal and State Research and Development tax credits. Agriculture is the anchor of Mississippi’s economy. The sector contributes $7.4 billion in income, 22% of the state’s total income, and an additional $16.1 billion in value-added income, representing 21% of the state’s total value-added income. 10.9 million acres consist of over 37,100 farms in Mississippi, which is considerably larger than the entire state of Maryland. Mississippian Farmers harvest everything from chicken and cows to peanuts and sweet potatoes. Broiler chickens are the number one commodity in Mississippi, accounting for $2.88 billion in production in 2014. Approximately 738,000 broilers were produced in the state that year. Mississippi currently ranks #5 in the United States in broiler production. A typical farmer in Mississippi has four to six chicken houses. Each house holds approximately 23,000 birds. Almost all broilers in Mississippi are also processed in their plants. Chicken houses, as well as poultry processing plants, are very technologically oriented. Engineers have been working since the 1980’s to develop faster, more automated and less expensive ways to remove water from a valuable poultry byproduct. This process is known as skimming. Today, given the trend towards healthy all-natural foods, speeding up the separation process without adding chemicals is a major challenge in the efficient recovery of skimming. Other technological developments involve data entry terminals networked along processing lines. This forms the basis for a tracking system to automate post-mortem poultry inspection. Low-cost imaging, robotics, and sensor technologies comprise the central components of this, and similar automated systems. Additional innovative technologies in the poultry industry include energy efficient LED lighting, state-of-the-art HVAC systems to control air conditions, antibiotic development, disease control, food safety inspection, software analytics, feed pusher robots, and 3D cameras. Similar technologies are integrated in beef and poultry farms and factories across the state. Animal agriculture is not the only innovative sector in Mississippi’s agricultural industry. Climate and soil conditions are excellent for growing soybeans, rice, cotton, corn, grain, and wheat. Most of the topsoil is fertile silt that was deposited by the Mississippi River floodwaters. Thus, farms incorporate innovative techniques to combat issues in fertilizing and pesticides, spoiled/contaminated produce, lack of workers, and harvesting. Sensors and mobile technologies are incorporated to monitor essential farming activities. These sensors, in conjunction with cameras, collect big data on factors including soil moisture, weather pattern predictions, traffic patterns of pests, and infestations. The use of this big data leads to increased efficiency when dealing with expansive fields of corn, wheat, and soybeans. Robotics is also integrated into the agricultural sector for planting, irrigating, and harvesting crops. Given a growing shortage of farm workers, farmers are increasingly challenged with attending to and harvesting large plots of crops on their own. Automated harvesters can be used to increase efficiency of each worker since they would no longer have to harvest manually, by hand. Finally, farming vehicles are becoming increasingly sophisticated. 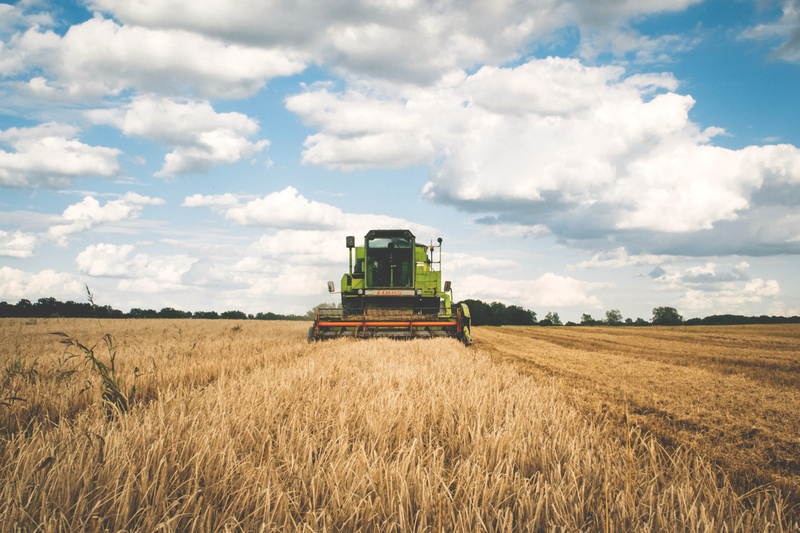 Agricultural equipment in the current market incorporates features like GPS, sensors, and cloud data analytics. The newest John Deere tractors are equipped with synchronization technology that syncs with grain carts travelling alongside it. John Deere systems feature cloud-based data access so farmers can monitor soil and nutrient levels while they are working the fields. Manufacturing is the top revenue-generating sector of Mississippi’s economy. Manufacturers account for 14.38% of the total output, employing 12.66% of the workforce. Total output from manufacturing was $15.13 billion in 2013. In addition, there were 141,800 manufacturing employees in 2014, with an average annual compensation of $55,725 in 2013. Mississippian Manufacturers produce everything from chemical products to food and beverages to aerospace and appliances. 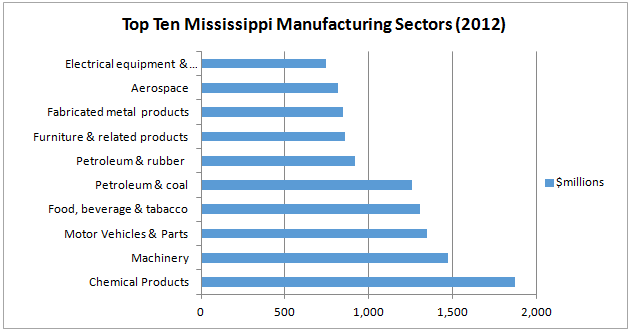 The proceeding chart demonstrates the 2012 top ten Mississippi manufacturing sectors in millions of dollars. Manufacturing is traditionally one of the most research and development intensive industries. Chemical production produces more revenue than any other manufacturing sector in Mississippi. Chemical engineers use raw materials such as oil, natural gas, air, water, metals, and minerals to create products we use on a daily basis. Plastics, rubbers, fibers, polymers, semi-conductors, explosives, detergents, pesticides, clothing, and even food products involve some level of chemical engineering. In the automotive industry, R&D is central to any successful automobile or parts manufacturer. Globally, automakers spend close to $102 billion annually on R&D. In comparison, the entire global aerospace and defense industry spent approximately $25 billion in 2013. Products manufactured by the automotive industry are among the most technologically sophisticated ones available to the public. The food, beverage, and tobacco industries are becoming increasingly innovation-oriented as well. Given the growing worldwide population and current demand for fresh, all-natural, nutrient rich foods, food production companies spend considerable amounts on R&D to compete on taste quality, nutritional content, shelf-life, and price. Innovation is challenging for the food processing industry due to flavor, texture, temperature, customs, and consumer price constraints. Many companies incorporating better ingredients face challenges in finding supplies for the appropriate ingredients. Companies incorporating improved processes and techniques face the issue of whether the new processes and techniques are safe for consumers and whether they can be used on a large scale. Mississippi has an abundant supply of well-educated and productive workers. Mississippi’s 15 community colleges offer training programs that prepare workers for new and existing industries. In 2014, more than 96,000 individuals from 550 companies benefited from community college workforce training. Mississippi’s research universities have a strong reputation for collaborating with industry companies to move innovation from concept to reality. All these factors combine to give Mississippi a competitive edge amongst today’s global and domestic manufacturing companies. This college has a number of technology-related programs that drive innovation in Mississippi. The Advanced Manufacturing Partners program partners with industries across North Mississippi to provide highly skilled electronics engineering technicians. NMCC offers paid interns from their Industrial Electronics Engineering Technology program. They are currently partnered with Toyoda Gosei, Schulz, FEUER, Parker Hannifin, and numerous others. The mechanical technology degree program helps students prepare to analyze specifications, lay out metal stock, and set up and operate machine tools to fit and assemble parts for the manufacturer. They also learn to repair metalworking, and cut tools, fixtures, gauges, and machinist’s hand tools with Precision Manufacturing and Machining Technology. This college offers 29 career-technical programs. The Center for Manufacturing Technology Excellence is an advanced technology-training center that offers a number of technical certificates, advanced production skills courses, and specialized training for companies. The University of Mississippi is one of the State’s premier Research Universities. There are numerous opportunities for collaboration between the industry and University of Mississippi. State of the art facilities, such as the Thad Cochran National Center for Natural Products Research and the Jamie L. Whitten National Center for Physical Acoustics, are offered as unique resources to conduct research and development. In addition, there are an additional 39 research centers to be utilized by the industry in collaboration with the school. Mississippi State University is extremely research-oriented. The National Science Foundation ranks Mississippi State among the nation’s top 100 research institutions. MSU’s research expenditures totaled $210 million in 2014, accounting for more than half of the total $410 million in research and development expenditures reported by all Mississippi institutions. The Franklin Furniture Institute at Mississippi State University conducts research focused on furniture design, production, performance, distribution, and marketing. The facility has extensive testing capabilities and offers technical support to deliver new technologies, methods, and findings to the furniture industry. The institute helps ensure a high-quality workforce to educate future managers and industry leaders. As a comprehensive Carnegie Research University, USM conducts research across a broad range of technological sectors, including biological sciences, coastal sciences, health, marine science, and polymers and high performance materials. The University of Southern Mississippi’s Business and Innovation Assistance Centers mission is to bring research efforts to market by collaborating with local industry and business. The Center identifies networks and facilitates partnerships with federal, state, university, and private organizations to combine their resources and capabilities to support innovative technological development and commercialization. Innovation is a central focus in Mississippi’s current economic strategy. The top two industrial sectors in the state are manufacturing and agriculture. Federal and State R&D tax credits are now available for organizations that perform such innovative research and development, especially in the advancing agriculture and manufacturing sectors.